Probiotic foods have gained popularity in the past few years, mainly because of increased focus on the need to keep the digestive system healthy. If you are wondering which types of food can provide you with the highest amount of probiotics, then this report will give you some answers. Probiotics are live microorganisms that provide health benefits to the host. Some of the more common microbes that act as probiotics are lactic acid bacteria and bifidobacteria, although this does not mean that only bacteria can be used as probiotics. Certain bacilli and yeasts have also been proven to be effective in terms of acting as probiotics. These “friendly microorganisms” have been touted as effective in treating certain diseases, particularly those affecting the digestive system, and have also been found to be helpful in keeping the whole body healthy. However, further studies are still in the works to better understand the extent of probiotics’ benefits and whether they have potential negative effects on the body. There are various so-called probiotic foods or foods that are fermented and contain active live cultures that function as probiotics. These include soy-based food, yogurt, fermented milk, tempeh, certain types of juice drinks, miso and even some dietary supplements. These foods, drinks and supplements may already contain probiotic bacteria in their original forms or they may have been added when the final product is being prepared or processed. There are also bacteria that have similar characteristics and functions with those of probiotics that are already found on people’s stomach. There are several health benefits believed to be provided by probiotic foods. Primarily, probiotics are thought to be beneficial in that they improve the microbial balance in the intestines, thereby preventing toxins and pathogens from growing in the stomach and instigating certain illnesses. Most of the studies about these good bacteria point to their effectiveness in preventing intestinal diseases, urogenital infections, atopic diseases and other digestive problems, such as diarrhea. Although there are several research efforts touting these benefits, experts believe that further studies are still needed for a definitive conclusion on what effects do probiotics really have on our bodies. There have been comparisons made between probiotics and prebiotics. Both have benefits on the body, but some experts have asserted that the latter is, arguably, the more beneficial. For one, probiotics are unable to stimulate metabolism, something that prebiotics are easily able to do. Prebiotics, in their simplest form, are dietary fibers that function as stimulants for good bacteria. They induce the growth and activities of helpful bacteria and are particularly beneficial when it comes to keeping the intestinal flora in good and healthy condition. What’s more, prebiotics remain intact and are able to go directly to the large intestine where they perform their main functions. This is one of the advantages that prebiotics are believed to have over probiotics, since the latter’s ability to remain unaltered after undergoing processing has yet to be established. Prebiotics are most commonly found in inulin, a dietary fiber contained in plants that have fructan. Some of the more common examples are asparagus, kiwi fruit, leeks and artichokes among others. Because prebiotics have started to emerge as a powerful tool in maintaining digestive health, food manufacturers have started adding these fibers into certain foods, like bread, drinks, cereals and other common food options. It has been thought of that without prebiotics, probiotics will not be as effective as they should be. Regardless of whether prebiotics are better than probiotics or not, the main thing is that both have their own sets of advantages and can work together to promote a healthy digestive system. However, if what you are looking for is an effective product that can help keep your digestive system healthy, then dietary supplements with prebiotics may be the best option. At least, you do not need to reserve extra thought on what food to eat everyday to get your proper dose of prebiotics. One capsule or tablet of prebiotic-containing supplement will be enough to keep you going. 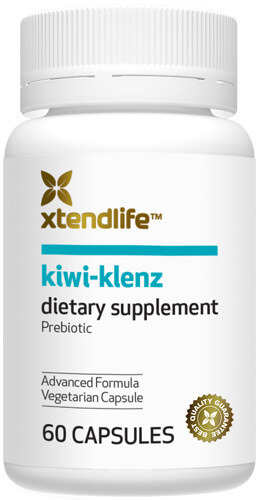 One option that you may want to explore is Kiwi-Klenz. As opposed to other digestive health supplements, the focus of this product is prebiotics, which can provide you with more benefits compared with merely consuming probiotic foods or supplements that contain only probiotics.